Our pioneering fundamental work has shown the ability to manipulate quasiparticles in two-dimensional materials such as monolayer and few-layer molybdenum disulphide (MoS2) using acoustic fields. Specifically, we have demonstrated the possibility for reversibly modulating the trion to exciton transition and their subsequent transport and hence spatial separation within the material. ​AR Rezk, B Carey, AF Chrimes, DWM Lau, BC Gibson, C Zheng, MS Fuhrer, LY Yeo, K Kalantar-zadeh. 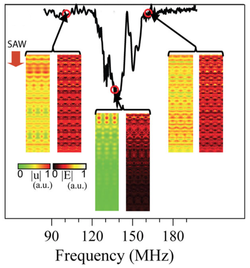 Acoustically-Driven Trion and Exciton Modulation in Piezoelectric Two-Dimensional MoS2. Nano Lett 16, 849–855 (2016). AR Rezk, S Walia, R Ramanathan, H Nili, JZ Ou, V Bansal, JR Friend, M Bhaskaran, LY Yeo, S Sriram. Acoustic–Excitonic Coupling for Dynamic Photoluminescence Manipulation of Quasi-2D MoS2 Nanoflakes. Adv Opt Mater 3, 888–894 (2015) [Article coverart selected as journal front cover]. The large surface acceleration associated with MHz-order surface acoustic wave (SAW) vibration—on the order of 10 million g’s—can be exploited for rapid micro/nanoscale material processing, for example, the debundling carbon nanotube agglomerates, or, for the synthesis of crystalline materials. In the latter, the unique evaporation rate regimes that can be accessed have given rise to novel crystal morphologies, previously undiscovered. Moreover, the large mechanical stresses arising from the strong surface acceleration, together with the high intensity electric field inherent in the electromechanical coupling of the acoustic wave during SAW microcentrifugation and nebulisation, can also be used to rapidly exfoliate bulk three-dimensional crystalline transitional metal dichalcogenides such as molybdenum disulphide (MoS2) into monolayer and few-layer nanosheets with high yield. ​M Miansari, A Qi, LY Yeo, JR Friend. Vibration-Induced Deagglomeration and Shear-Induced Alignment of Carbon Nanotubes in Air. Adv Funct Mater 25, 1014–1023 (2015) [Article coverart selected as journal front cover 7/2015 p 989]. H Ahmed, L Lee, C Darmanin, LY Yeo. A Novel Acoustomicrofluidic Nebulization Technique Yielding New Crystallization Morphologies. Adv Mater 30, 1602040 (2018) [Article coverart selected as journal frontispiece 30, 1870018]. S Marqus, H Ahmed, M Ahmed, C Xu, AR Rezk, LY Yeo. Increasing Exfoliation Yield in the Synthesis of MoS2 Quantum Dots for Optoelectronic and Other Applications through a Continuous Multicycle Acoustomicrofluidic Approach. ACS Appl Nano Mater 1, 2503–2508 (2018). M Mohiuddin, Y Wang, A Zavabeti, N Syed, RS Datta, H Ahmed, T Daeneke, SP Russo, AR Rezk, LY Yeo, K Kalantar-zadeh. Liquid Phase Acoustic Wave Exfoliation of Layered MoS2: Critical Impact of Electric Field in Efficiency. Chem Mater 30, 5593–5601 (2018) [Article featured in ACS Editors’ Choice]. H Ahmed, AR Rezk, BJ Carey, Y Wang, M Mohiuddin, KJ Berean, SP Russo, K Kalantar-zadeh, LY Yeo. Ultrafast Acoustofluidic Exfoliation of Stratified Crystals. Adv Mater 30, 1704756 (2018). SAW phononic band gap structures, in which phonons are prohibited from propagating, arising from surface phonon-polariton coupling in two-dimensional structures are demonstrated in monolithic phononic crystals that are completely mechanically, electromagnetically and topographically homogeneous, thus opening up new possibilities for a wide range of acoustic-optic and acoustofluidic applications. ​​D Yudistira, A Boes, B Djafari-Rouhani, Y Pennec, LY Yeo, A Mitchell, JR Friend. Monolithic Phononic Crystals with a Surface Acoustic Band Gap from Surface Phonon-Polariton Coupling. Phys Rev Lett 113, 215503 (2014). D Yudistira, A Boes, B Dumas, AR Rezk, M Yousefi, B Djafari-Rouhani, LY Yeo, A Mitchell. Phonon-Polariton Entrapment in Homogenous Surface Phonon Cavities. Ann Phys 528, 365–372 (2016) [Article coverart selected for journal back cover p 434]. D Yudistira, A Boes, B Graczykowski, F Alzina, LY Yeo, CM Sotomayor Torres, A Mitchell. Nanoscale Pillar Hypersonic Surface Phononic Crystals. Phys Rev B 94, 094304 (2016).